Years ago, at an age when I tended to judge the worth of a piece of audio equipment by the number of controls it had, I encountered my first equalizer, and it was love at first sight. All those neatly spaced knobs were a twiddler's dream, and I soon learned that I could alter the character of my system's output in ways I had never imagined. Unfortunately, almost all of the things I did made the sound worse, and I eventually came to the realization that my early experimentation was useful mainly in teaching me what various nonlinearities sounded like. The easiest way to understand what an equalizer does is to think of it as an elaborate set of tone controls. There's no question that such a response-altering device can be a very useful tool in fine tuning an audio system, and equalizers also have a number of creative applications. But an equalizer is a very specialized type of component, and many people buy one expecting it to cure all sorts of evils that it really can’t When it doesn’t perform the anticipated marvels, the user is disappointed and may ditch the equipment rather than learn how to use it properly. So before you invest in an equalizer, it's a good idea to understand what it can and can't do. An equalizer is a collection of frequency-selective level controls, each of which affects only a portion of the audio spectrum. As already mentioned, you can think of a typical equalizer as a bunch of souped up tone controls but that description can also be stood on its head: Ordinary tone controls are basically two-band (bass and treble) equalizers that divide the audio band into an upper and a lower section and deal with them individually. In some cases their effects overlap in the middle, whereas in others there is a gap that is affected by neither the bass nor the treble control. Some manufacturers do provide a "midrange" control, and one or two even call such three-band tone-control configurations "equalizers," but common usage normally restricts the word to devices with five or more bands (or to complex parametric equalizers, which let you alter the bands over which the controls operate). There is no fundamental limit on the number of bands the audio spectrum can be sliced into. Generally speaking, the more bands, the finer the control that can be exercised. On the other hand, increasing the number of controls tends to make an equalizer both more costly and more difficult to use. Five-band equalizers are somewhat more flexible than ordinary tone controls and are still relatively easy to operate, but this configuration is most likely to show up built into another type of component, such as a receiver. Separate equalizers usually provide at least seven bands, and at this level an equalizer can begin to be considered a serious device. For home audio, perhaps the most common variety is the octave-band equalizer, which splits the audio range into ten separate bands, each roughly an octave wide. (An octave is defined by a doubling of frequency: For example, the range from 50 to 100Hz is an octave wide, as are the ranges between 100 and 200 Hz, 200 and 400 Hz, and so on.) Some equalizers have twelve bands, but these are usually called octave equalizers anyway. 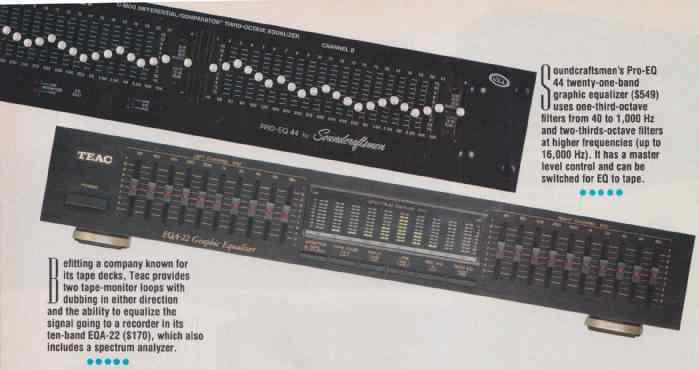 Professional equalizers often split the spectrum into bands that cover one-third of an octave, providing thirty to thirty-six separate controls. Many consumer models have a single slider for each frequency band that controls both stereo channels, whereas others have separate controls for independent equalization of left and right channels. The latter tend to be bigger, costlier, and clumsier to use for some purposes, but there are applications in which this degree of control is necessary. For every one of its divisions of the audio spectrum, an equalizer contains a pair of bandpass filters (one for each channel) that blocks all signals outside a certain range of frequencies. Signals that make it through the filters are amplified and fed to the corresponding level controls (operated from the front panel), which can cut or boost the signals in their bands by as much as 12 dB and occasionally more. The outputs of all the level controls for a channel are then combined to make a single signal, which is fed to the equalizer’s output and thence to the preamp or power amp. 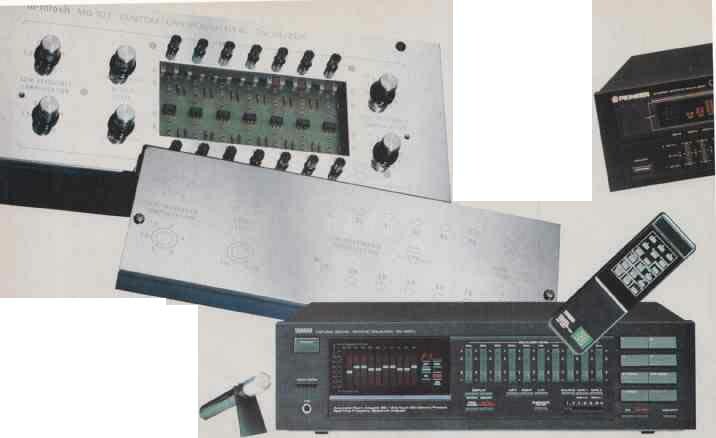 Very early equalizers, like the one I first played with, had panels full of rotary controls, but these made it difficult to know exactly what you were doing. Now almost all equalizers use vertical sliders, neatly lined up beside one another, and their settings together give a visual depiction of the applied response alteration (but not the overall output response, which is the sum of the input curve plus whatever modifications have been made by the equalizer). The ability to read the slider settings as a response curve has lent the name “graphic equalizer” to this type of device. More sophisticated, but much harder to master, is the parametric equalizer, which is a sort of custom filter that can be tailored in a number of ways to solve complex audio problems. Normally a parametric equalizer provides only one or two adjustment bands per channel, but their characteristics can be altered to an extent impossible with a graphic equalizer. Both the center frequencies and the widths of the bands are controllable, as well as the amount of cut or boost, so it is possible to focus on a specific problem area, make a very precise correction, and leave the rest of the signal alone. Parametrics are normally used to fix a single serious problem, so many of them are designed to be set up and then hidden away; if you want an equalizer just to tinker with the sound, you should probably go with a graphic model. Whatever sort of equalizer you choose, the method of inserting it into the system can affect what it is able to do. With separate components, an equalizer is normally inserted between the preamplifier outputs and the power-amplifier inputs; the same arrangement can be obtained by connecting the equalizer between a receiver or integrated amplifier’s preamp-out and main-amp-in jacks, if any are provided. A potential drawback to this scheme is that it limits the equalizer to altering the sound being listened to at the moment. If you ever want to record equalized signals, it is better to connect the equalizer in a tape-monitor loop. 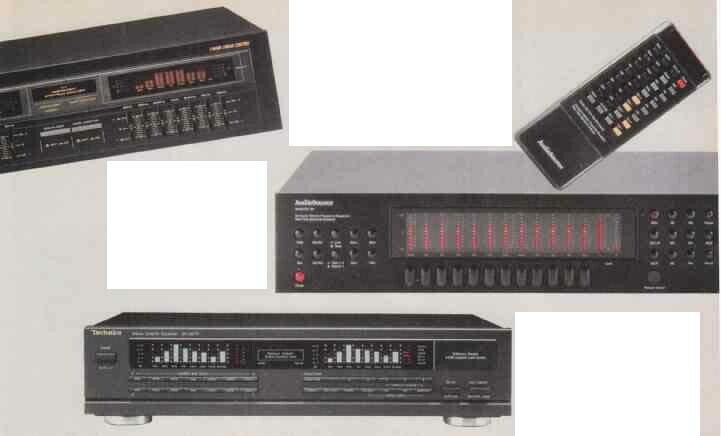 Almost all equalizers provide replacement tape-monitor connections (so that adding the equalizer doesn’t force you to give up a tape deck), and many also include switching to enable routing the equalized signal to an attached tape deck. In other cases, using the tape dubbing provisions on a receiver, amplifier, or preamplifier with two monitor loops can achieve the same goal: The receiver simply thinks the equalizer is a tape deck and “dubs” its output to a real recorder. New equalizer owners often have an uncontrollable urge to “correct” absolutely everything, with quite vari able results. But there are times when the sound can definitely benefit from a little judicious tweaking. Some recordings suffer from the heavy hand of an engineer playing with his own equalizer, and a home or car unit can be just the ticket to undo such sonic abuses. This is particularly true with CD’S made from masters that were originally equalized to compensate for some of the perceived limitations of vinyl pressings (principally treble losses). The resulting harshness of such recordings can often be tamed nicely with an equalizer. Old or damaged recordings might also benefit from equalizer massage. Equalization might reduce their fidelity somewhat in absolute terms, but it might also make them listenable. Damaged vinyl records, for instance, can often be rendered tolerable by attenuating the top few bands, where most of the surface noise and distortion resides. Any dulling of the sound can be offset to some extent by a bit of boost in the band or two just below those you’ve attenuated. By the same token, old tape recordings with a lot of hiss sometimes sound better with the top octave or so removed; some music might be lost too, but the overall effect is often much better. Such creative equalization can, and should, be done by ear; if the result sounds better, you’ve done it right. For such purposes, an equalizer can be quite Spartan yet still very effective. Some models, however, provide extras that can make them more convenient to use under certain circumstances. For example, some equalizers have overall output controls, which enable you to balance the apparent loudness of processed and unprocessed signals. This is unimportant if you intend to set up your equalizer and forget it, but if you use the equalizer only occasionally, a master level control will prevent abrupt changes in volume when you switch the equalizer into or out of the circuit. Another extra is a built-in real time spectrum analyzer, which gives an illuminated display of the signal level in each of the equalizer’s bands at any given moment. Such analyzers can sometimes help to identify frequencies that have been given too much prominence by the recording engineer, and they can be handy for room equalization; mostly, however, they are just pretty to watch. Where expectations are often greatest for an equalizer—and where they most often lead to trouble—is as a remedy for ailments in your equipment or room acoustics. There is a popular sentiment, for example, that if your speakers are lacking in bass, you need only add an equalizer to pump up the output at the bottom. That does work within fairly narrow limits, but it should be done only when the problem is relatively small. If the speaker has a major bass deficiency, attacking it with equalization will mean fighting the speaker’s inherent limitations. All speakers have poorer sensitivity at very low frequencies than at middle and high ones, but this limitation is much more pronounced in models with very small cabinets or total woofer area (mini-speakers, for example). Pumping more power into a speaker to compensate for poor bass response may overdrive the amplifier or the speaker, causing gross distortion, or possibly even damage the speaker. The same is true at high frequencies, although the effects may not be as severe because the power required is less in the upper parts of the spectrum. In short, if the problem is a big one, the solution is not electronic; only better speakers will yield better sound. Above (left): Soundcraftsmen’s Pro-EQ 44 twenty-one-band graphic equalizer ($549) uses one-third-octave filters from 40 to 1,000 Hz and two-thirds-octave filters at higher frequencies (up to 16,000 Hz). It has a master level control and can be switched for EQ to tape. Equalizers tend to fare better when they are called on to attenuate rather than boost levels in certain bands, so they are usually quite good at reducing tubby lows or strident highs. How effective an equalizer is at controlling any particular coloration depends to some extent on how neatly the under lying response aberration fits the equalizer’s design—the shape, spacing, and placement of its bands. Usually the best you can expect is an approximate correction. In any case, the watchword should be moderation; al most anything you can do with an equalizer will sound better if you don’t do too much of it. The principle of moderation is especially apt when it comes to room equalization, in which the goal is to correct, or at least minimize, acoustically induced response anomalies. As it was once put to me, a room is a “mechanical equalizer,” so it’s not unreasonable to think that some of its effects might be undone electronically. Indeed, that’s what multiband equalizers were invented for, and they are used widely in professional applications for such fine tuning. Equalizers can indeed work wonders in some circumstances, but they are not a panacea. For one thing, the effects of a room on sound radiated into it are different for every speaker and listener position, so perfect equalization can be achieved for only one spot; moving your head even a few inches either way will change at least the high-frequency response at your ears. Such a limitation may well be acceptable in, say, a recording studio, where what the engineer seated at the console hears is of paramount importance. At home, it may be preferable to work at getting the low frequencies ironed out (most of the problems tend to be there anyway) and to settle for a reasonable approximation of the presumed ideal at high frequencies. You can fiddle with the controls until you think the system sounds right, but you’ll probably find this method rather tedious and uncertain. Professionals typically begin by making measurements with pink noise, a calibrated microphone, and a real time analyzer to see what the room is doing to the sound. They then adjust the equalizer to obtain the desired response. Some consumer equalizers provide tools for you to do the same thing—a built-in analyzer, a micro phone input, and often a microphone and a switchable pink-noise generator as well (if these are not supplied, you can always buy a separate microphone and a test CD with pink noise on it). This dilemma reflects a fundamental limitation of conventional equalizers, which is that they do not directly counteract the unwanted effects of room acoustics. The integrated response of the output from a loudspeaker with a flat frequency response and the reflections of that output within the room will not be flat. An equalizer attempts to correct the overall response by introducing compensatory nonlinearities into the output from the loud speaker; in order to make the total response flatter, the direct, first-arrival response of the speaker is made more ragged. All these factors together just about guarantee that you won’t want to follow the analyzer slavishly. You may, in fact, find that you do better just moving your furniture and speakers around and maybe adding some strategically placed sound absorption to floor and walls. Used properly, equalizers have a well-earned place in audio. Misused, as they often are, they can be an expensive way to achieve worse sound. It’s worth taking the trouble to use such a valuable tool correctly.